Behold, 5-Year-Old Ariana Grande Enthusiastically Riding a ZamboniAs it turns out, she was a huge hockey fan as a child. We Demand More Thomas Middleditch As Legendary Hockey Commentator Tony BabcockHoly smokes, this guy is good! Putin Scores 5 Goals in Exhibition Hockey Game With Former ProsThat’s down from his seven last year and eight in 2015. U.S. Women’s Hockey Team Wins First Gold in 20 YearsAfter three hours of play. 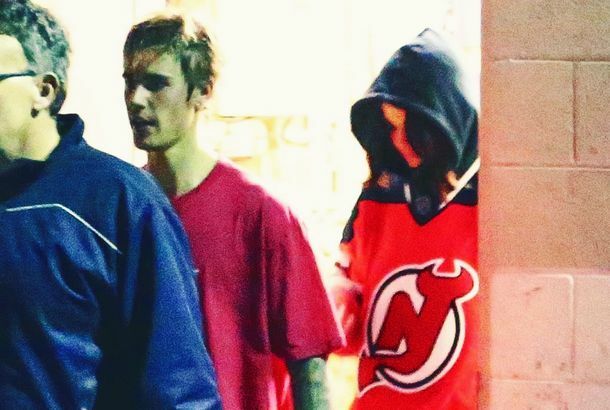 Why Is Selena Gomez Wearing Justin Bieber’s Sweaty Hockey Jersey?There’s no way that thing smelled okay after his game. Canadian Hockey Fans Say Versace Copied Their Old LogoCould Donatella Versace be a Vancouver Canucks fan? 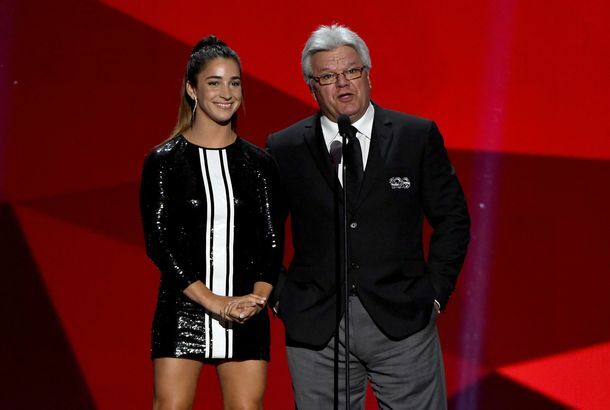 This Hockey Legend Commented on Aly Raisman’s Legs at the NHL AwardsOne more man provides feedback about her body. Hockey Stadium Gets Rid of Women’s Restrooms So Men Don’t Have to Wait So LongWomen had to wait in lines of up to 25 minutes as a result. The Fight for Fair Pay in Women’s Sports Isn’t OverMale athletes need to put their money where their mouths are. USA Hockey Has Given the Women’s Team a Deadline to End Their Fair-Pay BoycottThe players must declare their intentions to continue boycotting by 5 p.m. today. Here’s How the U.S. Women’s Hockey Team Is Protesting for Fair PayNegotiations have been going on for more than a year. Justin Bieber Gets Smashed Into Glass WallBaby, baby, baby … oooouch. The National Women’s Hockey League Adopts Transgender Participation PolicyIt goes into effect immediately. Watch the Islanders Score Two Goals in 3 Seconds, Tying the NHL RecordAnd you thought there wasn’t enough scoring in hockey. The National Women’s Hockey League Just Slashed Its Players’ Pay Without WarningIt’s the first women’s professional hockey league to pay players salaries. NHL Team to Hire a 26-Year-Old Stats Junkie As General ManagerHe’s just two years removed from college. With Eric Staal Trade, the Rangers Go All-InThey acquired the Hurricanes captain yesterday in advance of this afternoon’s trade deadline. Are the Islanders Really Looking to Leave Brooklyn? Probably Not.No breakout yet. These Hockey Players Being Showered With Teddy Bears Will Get You Through TodayIt’s going to be okay, I promise. See Vintage Photos of the Brooklyn AmericansThe former New York Americans changed their name for one season before folding, but they continued to play at Madison Square Garden. U.S. Women Deserve a Pro Hockey LeagueDani Rylan dreams of a women’s NHL. Why Superstitions Help Athletes Perform BetterIt’s all about confidence. A Guide to Jumping on the 2015 Rangers BandwagonThey’re in the Eastern Conference Finals for the third time in four years. A Guide to Jumping on the Rangers’ BandwagonThey’re two wins from the Stanley Cup Final. 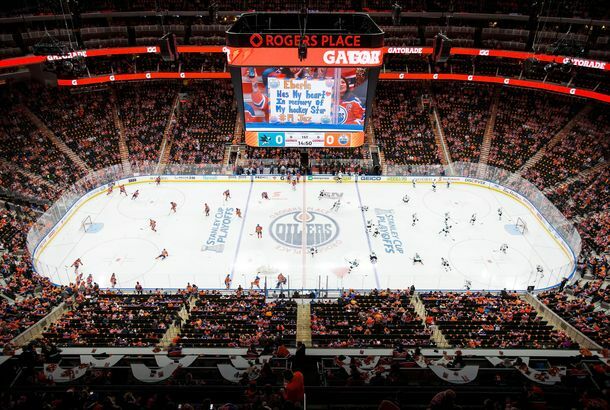 Runaway Beer-Company Blimp Was Sadly Unable to Escape CanadaThe aircraft went rogue during a hockey tournament on Saturday. Video: FDNY and NYPD Get Into Hockey BrawlEverybody loses! U.S. May Not Get Another Chance to Topple CanadaCanada won today’s semifinal, 1-0. Canada Rallies to Stun U.S. in Women’s Hockey Gold-Medal GameThe Americans had a two-goal lead late in the third period. Canada Survives, Sets Up Dream Hockey Matchup With U.S.Bring it on, ya hosers. 9 Photos of Sad Russian Hockey Fans in SochiThe Russian men’s hockey team lost in the quarterfinals. Team USA Beats Russia in Olympic Hockey PrelimsAmerica, meet T.J. Oshie. CeeLo Green Flipped Off Hockey Fans at Yankee Stadium Last NightIn his defense, they were booing him pretty loudly. Photos: Yankee Stadium Hosts Its First Hockey GameImages from the day. Five Jim Dolan–y Quotes From His New York Post InterviewThe owner of the Knicks and the Rangers gives a rare one-on-one interview. Human Zamboni Is an Actual Job for Hot GirlsHow can they clean the ice if they keep melting it? Here’s What the Renovated Madison Square Garden Looks LikeThe final phase of its makeover is complete. Rangers Season Preview: Readjust Your Expectations (Again)Alain Vigneault makes his debut as Rangers coach tonight. There Are Some Pretty Bad Seats for Hockey at Barclays CenterAvoid the west end of the arena. Everything You Need to Know About Barclays Center’s Hockey ConfigurationThe arena will host its first hockey game on September 21.